Hello blog universe! Welcome to the thoughts, experiences, reviews and photos of a guy from Melbourne, Australia, who loves exploring the tastes, sounds and locations that make the world so flavoursome. This blog is primarily the work of James. However, there is also a significant component provided by his wife and cooking with beer devotee, Jenn. She provides a fair chunk of the photography you see here, as well as tasting notes, proof reading, music and 80’s trivia, plus all round awesomeness. Beer – I’m no connoisseur and still consider myself relatively new to the world of beer and brewing. A few years ago I was challenged to try “something different” (from the mainstream lagers I was drinking) by a friend and I have not looked back since. With a booming craft beer industry in Melbourne and across Australia, I have spent my weekends exploring as many different beer varieties and brewers as possible. I now have an endless collection unique empty beer bottles to show for my “research” and I’m on an ongoing hunt for beer’s secrets. I seek beer with flavour, complexity, length and balance. I love beer with a story and brewed with heart. However, sometimes there’s just the right time and place for the old bland macro lager and hence am not beyond drinking an occasional stubby of Melbourne Bitter or a XXXX Gold. It’s all part of the beer journey…! Bars – I have labeled this category as “bars” to stick with the B theme, but this generally means: “bars, pubs, live music venues and other places to enjoy a good drink”. Melbourne is full of pubs, bars and venues that ooze character and history. Many have been reviewed thousands of times already, so when I visit a place and decide that is worth of a blog, I will be focusing on the things that tickle my fancy when heading out for a drink or a gig…like the beer selection available (say NO to bars with beer taps pouring only the same-same bland lagers of a macro brewery! ), eclectic objects on display behind the bar, toilet graffiti or just “the vibe” you get when you walk in the door. Bands (as well as various music bits and pieces) – I wish I was a rock star…haha…but I’ll just settle for enjoying the show from in the crowd. I love gigging and checking out a local rock band. I am especially a sucker for random “dirty pub rock” at a grungy little venue with talented bands who are often just starting out or still waiting to crack some big time. They are the bands that rarely get reviewed because they are too small or simply do not have a manager/publicist. Since I don’t travel too much, the primary focus of these thoughts and reviews will be on the Melbourne area, my home city that I love deeply, and sometimes around others corners of Australia. 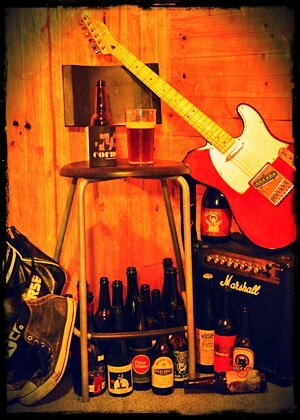 Enjoy, drink up and rock on. This blog is purely personal opinion. The style and purpose is very casual. I may often make completely unqualified and unverified comments, with my only claim to validity being experience. And hey…it’s a blog after-all! This blog is resourced at personal expense, hence the scrappy design and structure. I rely on my only basic abilities and direct my efforts to the words and facts instead of flashy visuals and design. Any freebies, samples or incentives provide for the purpose of this blog will be declared. Thank you for reading.